Convenient tripod stand allowing the table to be carried outside. Tripod remains in open position whilst moving the table. To fit pole diameter 55mm. New reinforced and more stable tripod to carry the table outside. THIS IS THE TRIPOD BASE ONLY PICTURE IS FOR ILLUSTRATION PURPOSES. Made of UV resistant plastic material. Now you dont need to have 2 different tables in your caravan or motorhome, the Fiamma Tripod Pro enable's you to take your dining table out of the van and use as a freestanding table. 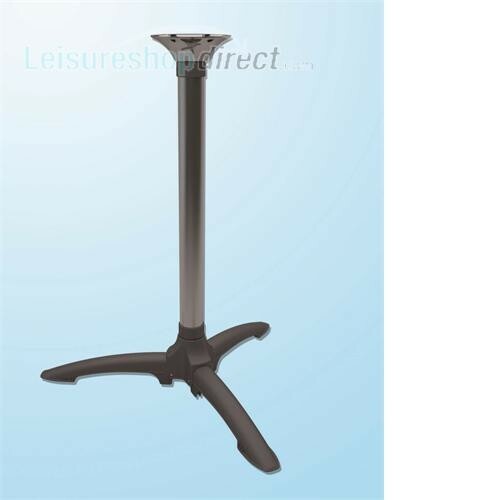 I bought this to make a small free-standing table to use in our caravan. It does the business very well. The only minor complaint is that the taper socket in the centre does not have the same close tolerance as the leg and the boss that goes on the underside of the table top. Still a very good system.